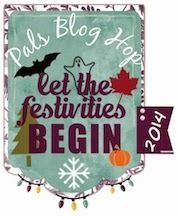 Welcome to the September Pals Blog Hop. 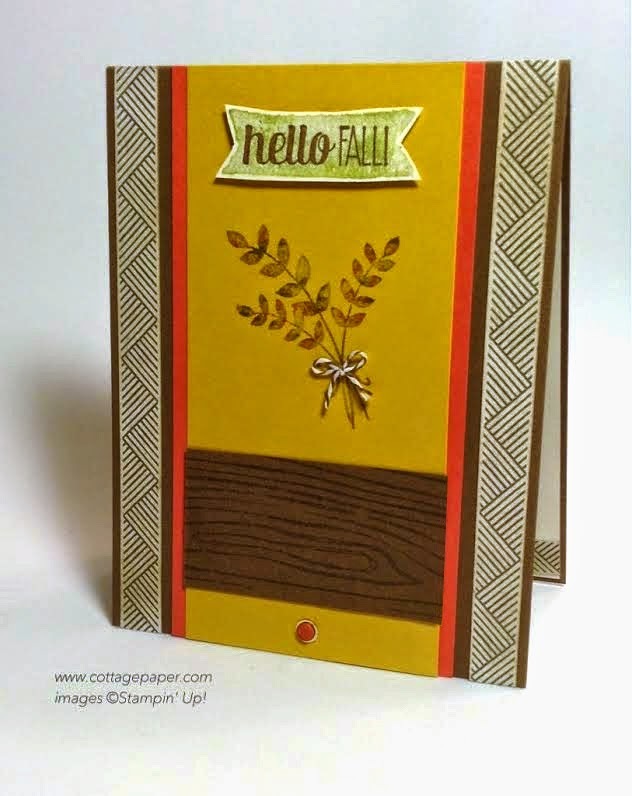 This month we are showing off our favorite new products from the new Stampin' Up! Holiday Catalog. We hope you enjoy our projects! 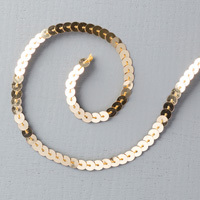 There really are soooo many wonderful products in the new Holiday catalog and I have been playing with many of them. For today's post I decided to pull out the For All Things set which I had not yet had a chance to use. I really like all the images in this set but I also like its versatility. While the images certainly look like Fall and Thanksgiving, they can also be used for all kinds of hellos and thank yous at other times of the year. Here is my card. I experimented with several ways to ink the banner - using the Old Olive ink pad or the marker - stamping off once or even twice. The exact formula depends on the look you want and how juicy your pad is. In the end I had a very juicy pad and I stamped off twice. Then I stamped the "Hello Fall" sentiment in Soft Suede on top of the banner. I inked the leaves with Crumb Cake and then "thumped" on them with Calypso Coral and Old Olive markers before stamping them. I added a piece of Soft Suede Baker's Twine I had from my Hey, Man Paper Pumpkin Kit (those kits come in handy in lots of ways!) but Early Espresso would work as well and Calypso Coral might be even better. The wood looking piece below the leaves was created by inking one side of the Woodgrain embossing folder with Versamark ink, inserting the cardstock piece and rolling a brayer across the folder several times. I LOVE that technique! I had planned to add three Calypso Coral Candy Dots sitting on gold sequins along the bottom but after I placed the middle one I decided I loved the look of just one and stopped there! The strips down each side are cut from a piece of Park Lane DSP. I really like the look of the geometric design and thought it went well with the Fall theme. The paper in that collection has a Whisper White background which was a little too bright to use here so I sponged the surface with Crumb Cake ink. I thought it turned out well! Your card says fall Katie. Like that you're able to use the PP leftovers! Katie, this card is lovely!! You pointed out all the wonderful details except one... I adore the DSP that you chose for the side panels. It really works with all of your colors and textures. Well done, Pal!! Thanks Katy! I love it too!! It's OK to love your own card; it's beautiful! It came together so nicely! Katie, your color choices are perfect for fall! Very nice Fall card, Katie! Love the DSP you used with your card. What a beautiful card and I love your technique! great layout on the card..thanks for sharing! Wonderfully masculine card design....very pretty!!! SOOOO agree with Natalie!!! Fabulous! This is one stamp set I am not getting tired of! I love the colors and your layout. Perfect!